Imagine being able to use your iPad for 99 hrs. You can do that now thanks to HyperMac, the company that provides external battery-bricks to the Mac ranges has now updated itself to provide the same for the iPads. The HyperMacs were until now used with a MacBook which can add an additional 34 hours of power to your Mac through a MagSafe adapter that is actually clipped to the power input of the Mac. Although the design was not approved by Apple (as if they approve anything at all) the system works great and extend the laptop life quite a bit. With the ability to recharge other gadgets these battery bricks are simply superb for a business traveller. Now they have been upgraded to 10 watts needed for the iPad. The 222 watt-hour HyperMac weighing at about 4.7 pounds can provide about 99 hours of up time to your ipad. With a price tag of $500 this military grade lithium ion battery packs are not cheap. The next lower pack costs about $200 for a 60 watt-hour version giving an approximate up time of 34 hours. Simply love the idea of 99 hrs uptime, thats simply awesome. Thats like using your iPad in Amazon jungle and not looking for a power outlet! Sweet! 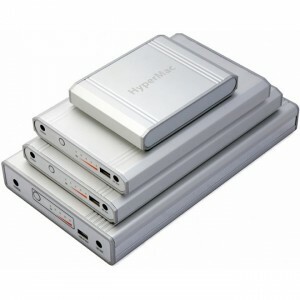 These power packs are avaible now and can be ordered from here. Previous Lenovo IdeaPad U160 Notebook is out! Next General Motors and Google working together? Or use it when you strand on an island in the middle of nowhere … great! !